One element of BAM Morgan Sindall Joint Venture’s M62 and M1 J39 to 42 smart motorway project involved the suspension of scaffolding beneath a bridge. The road remained periodically open to road-users, and therefore personnel operating from the scaffolding required protection from errant oncoming high-sided vehicles. 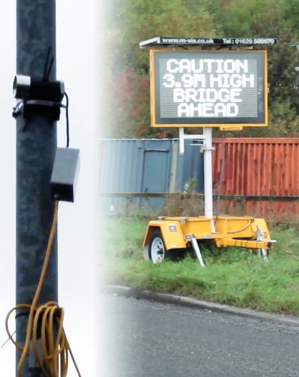 The customer deployed MVIS’ and partner Highway Resource Solutions’ pioneering temporary overheight detection solution, part of the Intelligent Safety workzone safety portfolio, which was the first temporary road maintenance safety offer to combine modular electronic perimeters and variable message signs (VMS). Signs in advance of the bridge directed high-sided vehicles away from the structure. An Intellicone Sentry Beam detected errant vehicles, activating a message on MVIS’ VMS-A, alerting drivers to their breach and enabling them to turn around and find an alternative route. Simultaneously, an audible Intellicone Portable Site Alarm on the scaffolding warned workers of the breach, allowing them sufficient time to reach a position of safety. “Historically, BAM and Morgan Sindall have warned drivers of overhead obstructions via goalposts or ‘hangman’ and clatterboard constructions. Neither was as effective as the MVIS/HRS solution at halting errant high-sided vehicles, and neither simultaneously alerted overhead personnel of safety breaches.